I've read that for any position, there are on average approximately 35 possible moves. But what's the maximum number of possible moves for a position? 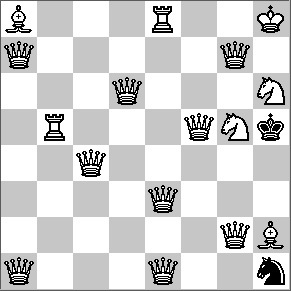 Main source: Guide to Fairy Chess. The book is a bit old, so there might be new record holders, but if that's the case, I was unable to find them. This is a legal layout with 195 possible moves. I'm sure it isn't the absolute maximum, since I just made this one by creating a pattern with the promoted Queens and then continually optimizing the layout from there. It should give you some idea about how you might achieve the maximum number of possible moves though. Thanks to bof for finding a way to add 2 additional moves. Not the answer you're looking for? Browse other questions tagged records or ask your own question. What is the maximum number of possible moves a player can choose from?